(AP) -- Samsung Electronics said Thursday workers at its semiconductor factories face no heightened cancer risk as the world's top maker of memory chips tried to quell health fears following employee illnesses and deaths. 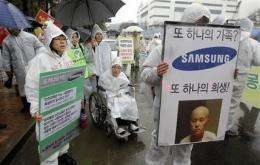 South Korea's biggest company is trying to reassure the public after a January lawsuit involving six people who developed leukemia and lymphoma they claim was caused by exposure to radiation and benzene, a carcinogen, in Samsung chip factories. Four of them have died. On Thursday, the company invited reporters to a chip plant south of Seoul to demonstrate its manufacturing process and emphasize its commitment to safety. "There is no risk," said Cho Soo-in, president of the company's memory division. Activist groups say at least 23 people - including those named in the suit - developed cancer over a period of about a decade due to working at Samsung and that at least nine have died. The lawsuit was filed against a government agency, the Korea Workers' Compensation & Welfare Service, after it refused to pay compensation following an investigation by occupational safety authorities who failed to find work-related causes for the cancers. Samsung is not a defendant but is cooperating with the service at the trial. Baak Young-mann, an attorney for the plaintiffs, said Thursday he was not surprised by Samsung's stance. "The workers, the victims, said they worked in a risky environment," Baak said. As for the risk of cancer among employees, he said Samsung's "opinion is far from the truth." Samsung Electronics Co. is a symbol to many South Koreans of their emerging industrial prowess - especially in technology, where the country is a force in flat screen TVs and mobile phones. But the company is a frequent target of critics who say it is too powerful and secretive. Samsung says that it ensures worker safety and has imposed rigorous management and operational systems in chip facilities to ensure employees are not exposed to carcinogens or radiation. Chip manufacturing requires numerous chemicals. Benzene has been frequently used as a solvent in the industry, though Samsung says it has never employed it. Samsung has taken the initiative in discussing the cancer issue since the death of Park Ji-yeon on March 31, a 23-year-old woman who worked at a Samsung chip plant and had leukemia. She was a plaintiff in the lawsuit. Family members represent the deceased in the suit, said Baak, the attorney. Shortly after she died, the company went on Twitter to offer an expression of mourning. "We would like to express deep condolences for our colleague who recently passed away from an unfortunate disease," Cho reiterated Thursday. He said Samsung wanted to "address the questions raised openly and transparently." He also said that Samsung plans to form a group consisting of institutes in South Korea and overseas and medical experts to reinvestigate the cancer issue, though offered no concrete details. Cho suggested that Samsung wants to use the current controversy to improve transparency. "From now on, we will openly conduct management that has its basis in communication," he said. Despite that, reporters were barred from filming or recording the press conference, though the company later released photos. A senior vice president for communications, Kim Jun-shik, cited the "characteristics of the semiconductor business."